Sensitive, responsive alarms are at the heart of a business’ commercial security systems. We do them right, every time. Don’t trust your commercial security to a one-size-fits all alarm system. Ours are custom designed for your buildings and their needs. Control who gets in and out of your building, and monitor access with our sophisticated card access systems for businesses of all sizes. We pride ourselves on meeting your commercial security needs professionally and efficiently, to best protect your assets. 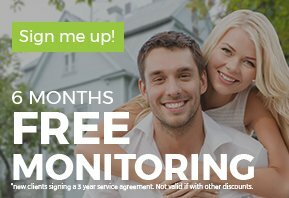 Protect your business day and night with our full service monitoring. You donʼt even need a landline for our systems; they can be set up and monitored using an Internet connection or a cellular network. Our commercial security products utilize the latest technology, ensuring your space is protected. Underwriters Laboratories of Canada: The program sets the standards for the operation of alarm monitoring stations. With our ULC system in place, you can rest assured youʼll have an uninterrupted power supply, appropriate staffing levels, high security levels and fast response times for any threats towards your business. With closed circuit television, youʼll be able to monitor your business from any connected remote location. Log onto the system and then view whatʼs happening in real time. Whether you want to keep an eye on whatʼs happening at business or youʼre monitoring past recordings our CCTV systems help you keep eyes everywhere and your commercial property secure.